I have been absent from my updating due to being distracted first by the crunch time of It’s Dark Outside and then by having a great old time doing a script development on a script by Bill McClusky called ‘Boomtown’ and finally by being away in Europe on an Alvin Sputnik tour (more to come about that!). So I just wanted to let you all know how it went! Anthony Watts: Gadget extraordinaire was trying to get the lights right. 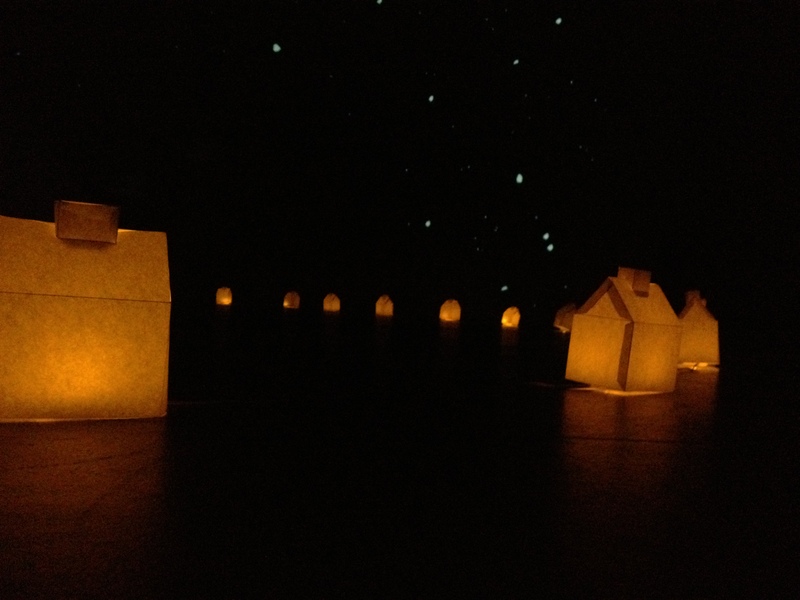 You see, we wanted the show to be self sufficient in everything including lights. So we used the same LEDs that we used for Alvin Sputnik (available at your local JAYCAR) and then Tim and Anthony developed a new system of operating the lights through MIDI so that we could operate the whole show; animation, sound and lights all through ‘QLab‘. I’m not the most technologically savvy person in the group so if you want to find out more about the technology email: timATweepingspoon.com. Meanwhile, Chris, Tim and I were trying to sew the show together, piece all the bits and pieces into a coherent storyline that made sense and was physically possible (i.e. time for me to get into the mask or for Chris to get into the Tent etc.) It was tough, it was stressful. We were trying to focus on a million elements at once and self-direct at the same time. We had lovely people come in and give us help and feedback. 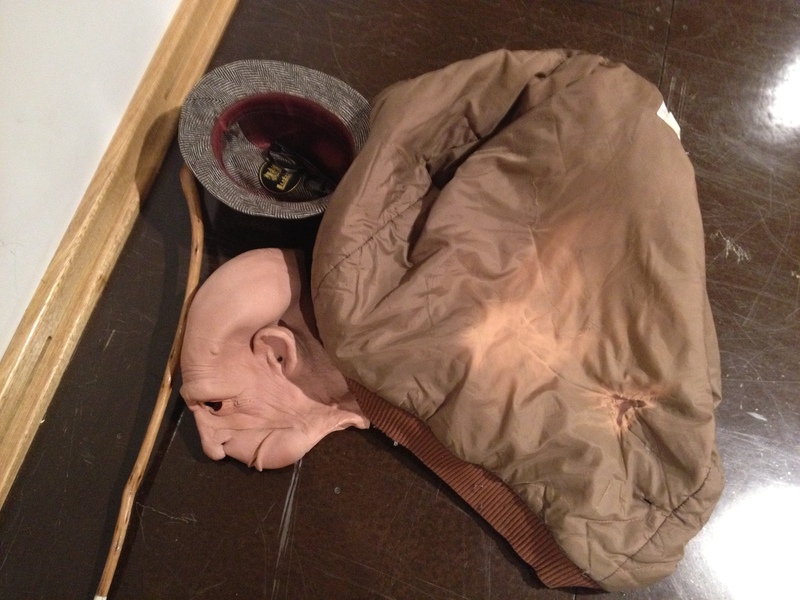 Michael Barlow from Spare Parts Puppet Theatre was a life-saver. He came in and gave us reassurance about the puppet we made and the puppet scenes we had done. 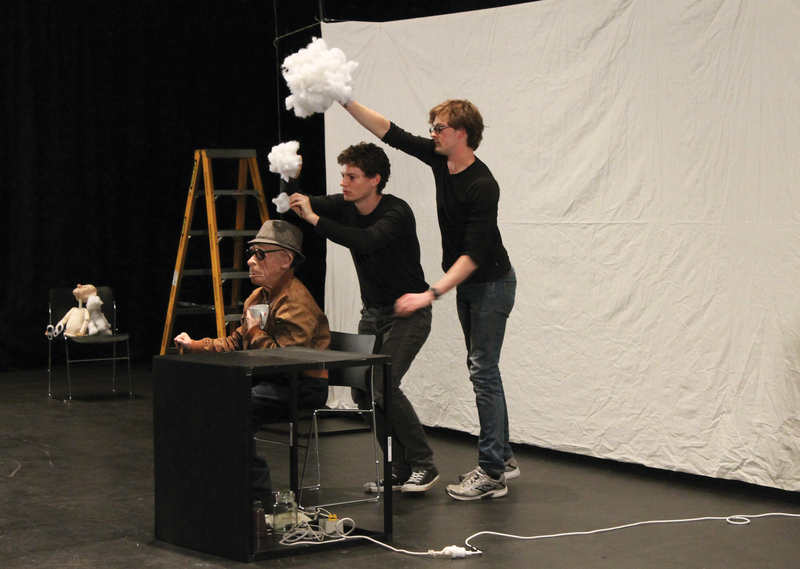 He also gave us invaluable dramaturgical advice. Mel Cantwell from PTCo was our outside eye for tech week, which was incredibly helpful, especially for performative elements (which often get overlooked in crunch time of a devised piece). Michelle Robin Anderson, Jeffrey Jay Fowler and Natalie Holmwood gave us tough feedback one week out, which lead to small but dramatic changes to structure, so the story made sense. And of course Julie and Tony Watts (Tim’s parents) who throughout the whole process given us amazing feedback, advice and support. When the day of the first preview rolled around, we hadn’t done a run of the show without stopping. We did one that afternoon and by showtime, we were shitting our pants (sorry but there is no other way to describe it). Are the audience going to know what’s happening? Is everything going to work? Is it even good? They did. It was. They liked it. We breathed again. 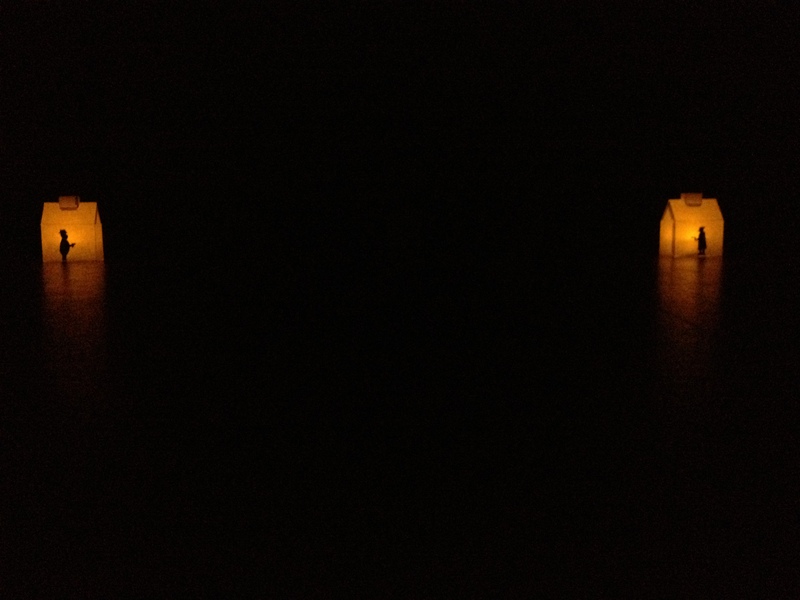 Oooohhh it’s finally here, the suspense is finally over, i’m going to blog about… WEEK TWO of It’s Dark Outside (buy tickets here). Alright, enough dramatics. Week Two was a very significant week in the development process as it marked the change from generating content for the show to starting to build the structure/putting the show in order. We came to the realisation that we had enough content, that we had a lot of scenes and that now we needed to string them together and make the show. First step, we made ‘scene cards’ (see below- it’s upside down and i don’t know how to fix that) so that we could put them in order and then move them around a whole lot as we changed our mind (this happens a lot), although to be fair the beginning and end stay pretty much where they are, it’s just the middle that keeps getting rearranged. We then started working through some of the scenes and adding more detail, fleshing out some of the least fleshy parts. p.s. Don’t be alarmed, i’m not wearing the mask in this rehearsal but i will be in the show. 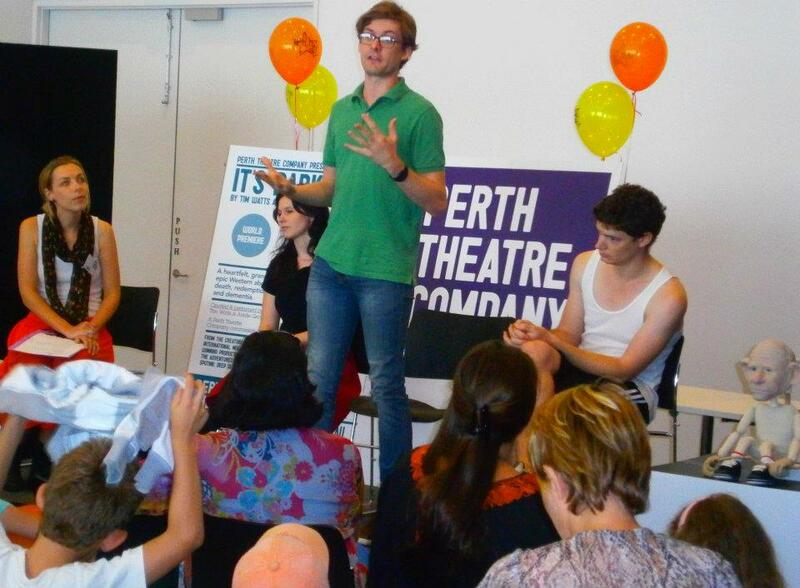 Next up in the week we had the special Perth Theatre Company members event. 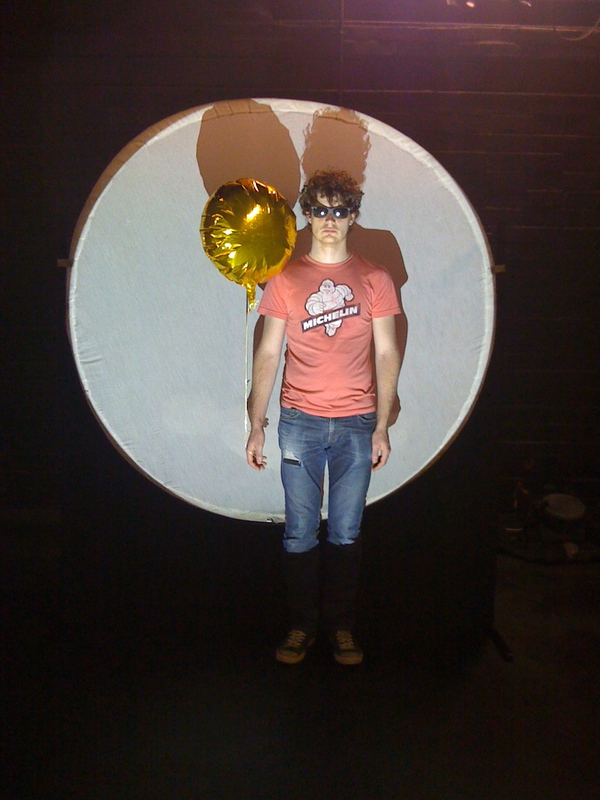 This meant we got the luxury of spending the whole day in the studio underground, which means we got to test out a whole lot of our ideas for set and lighting and see how they looked in the space… It also meant a whole lot of ‘dammit, that didn’t work as well as it did in my head’. 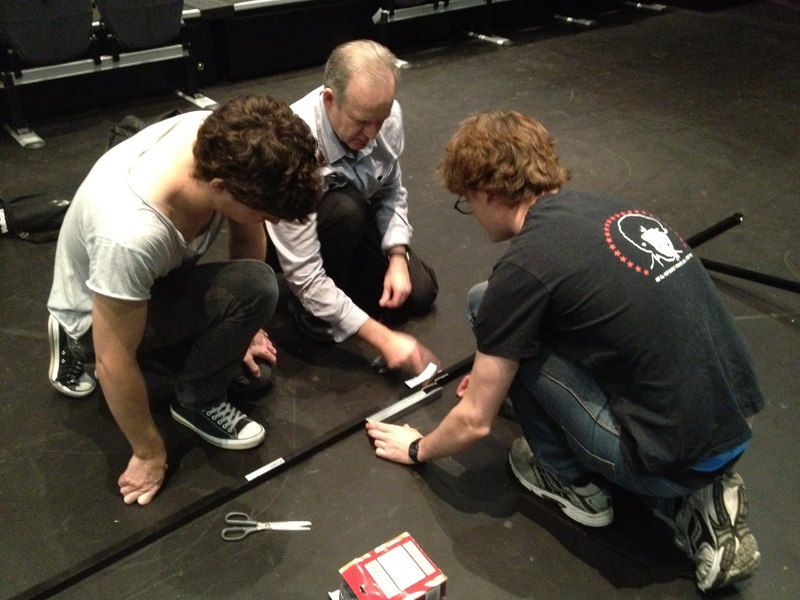 Papa Watts came in to help assemble prototype 1 of the screen that he had built for us, which was great to be able to try. We also showed a couple of scenes to the group of members and had a big ole chat afterwards (mainly about the show), and it was great to hear the feedback from them. It’s always a bit scary doing these showings. Putting your work out on the line when its unfinished and messy and transitions are clunky and performance is not at top quality, but it is always useful from a creator point of view. You find out what is translating and what isn’t, where the holes are in a piece, what your audience want from the piece, and where the show is not quite delivering. But then you also find out that parts of the show do work, or that parts of the story/images still move people, even without the gloss, which is very reassuring. p.s. 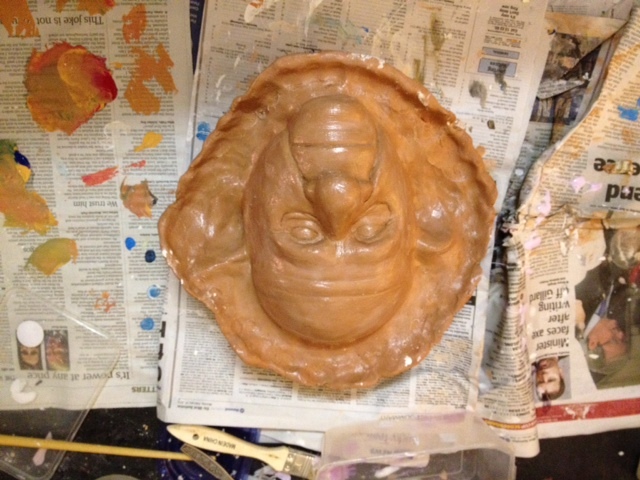 We have a new mask, created by Tim Watts, see image above. It hasn’t been painted yet so it looks a bit scary, but we will keep you in the loop as it gets worked on. So thought i would do an update! Firstly I just uploaded some of my brand spanking new headshots, taken by Deanna Whyte, they are in the ‘gallery‘ section if you want to have a look, if not, let’s proceed to IT’S DARK OUTSIDE! 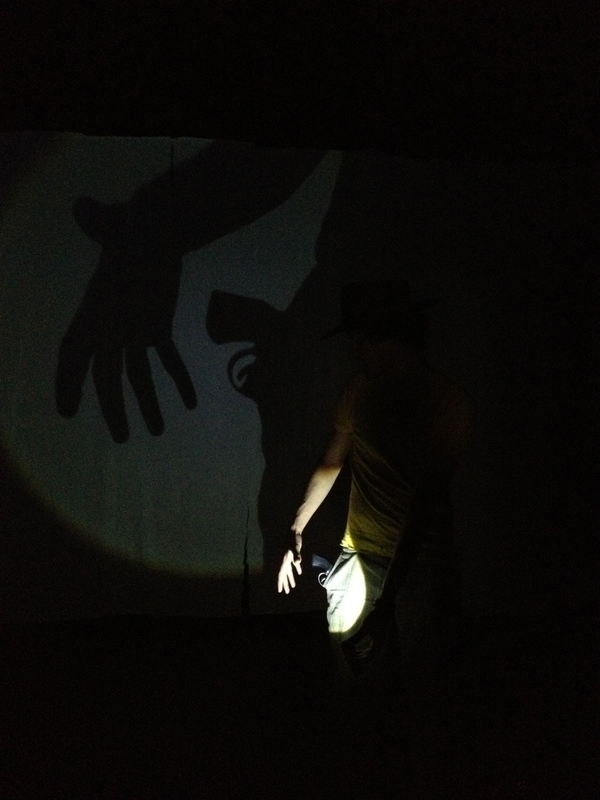 So this first week of development we were situated all the way out in Midland, at the Midland Junction Arts Centre. We wanted to focus on a couple of things this week. 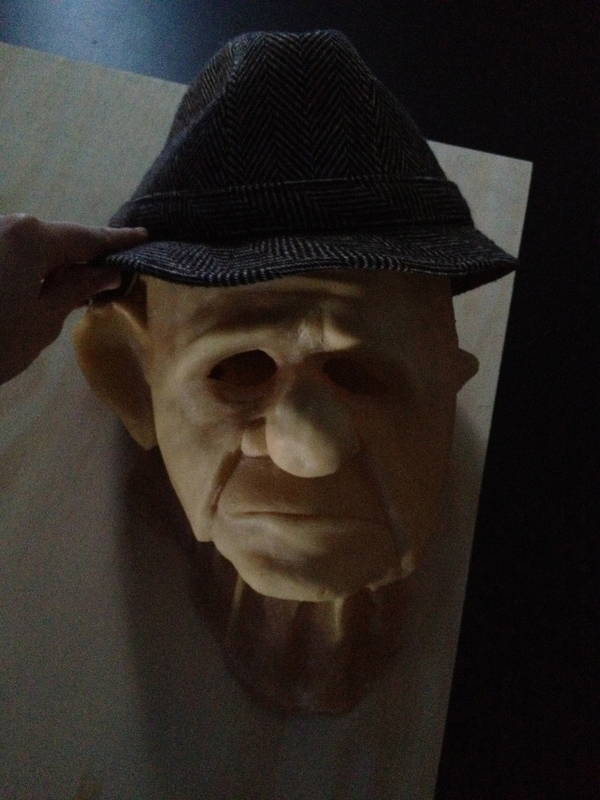 Firstly we wanted to work and expand on the mysterious man, as last development we focused on the old man. So see below pictures for a few insights. 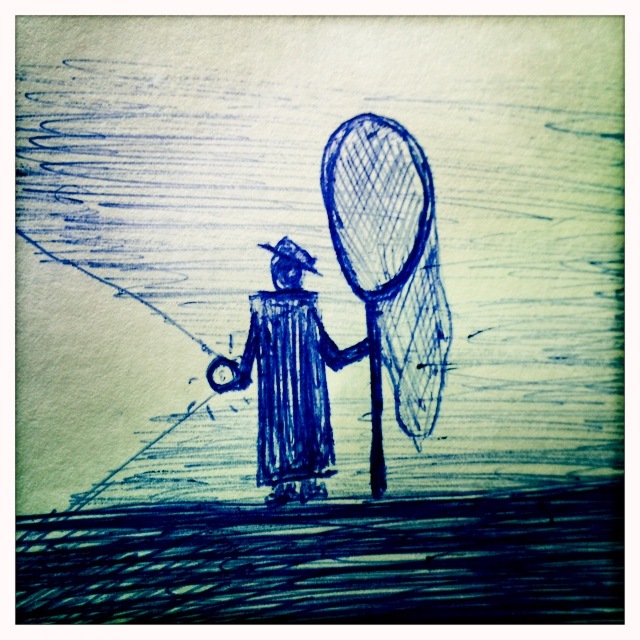 concept sketch by the talented Tim Watts. 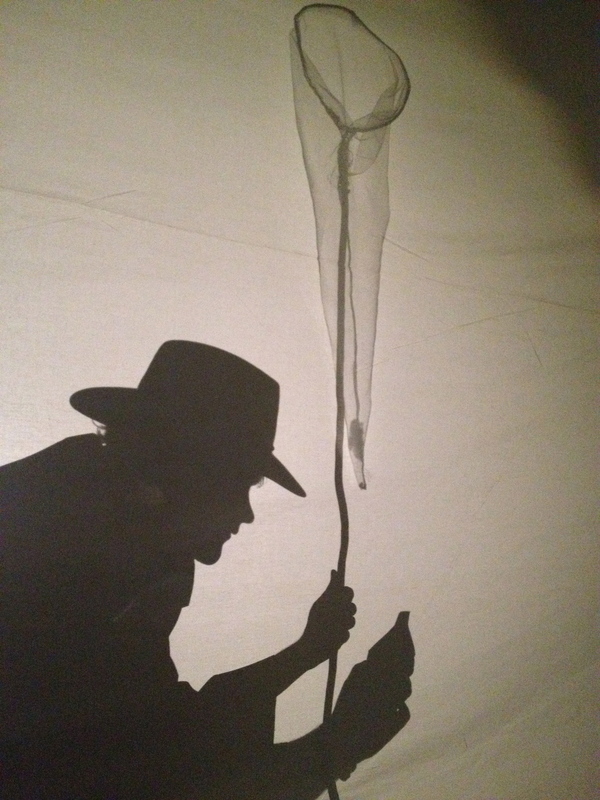 We came up with some pretty fun scenes with the mysterious man and we have now made discoveries about his identity… and of course the net is a new and exciting addition. 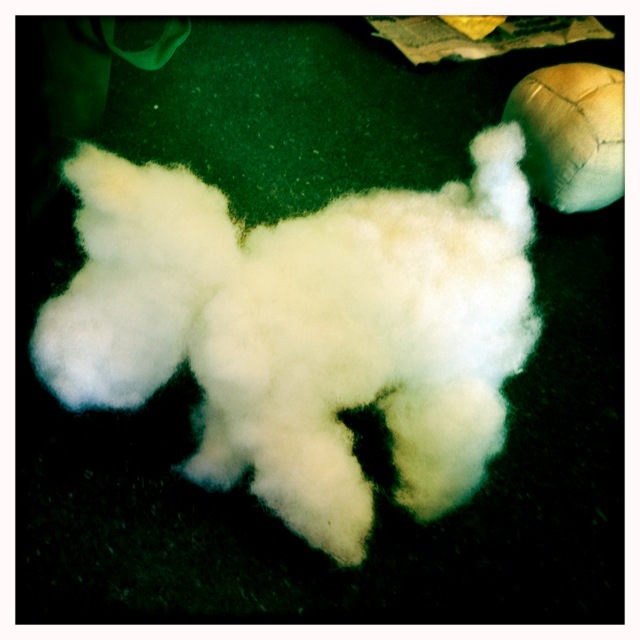 This week, we have also been playing around with ‘memory’ scenes and working with the possibilities of the stuffing. 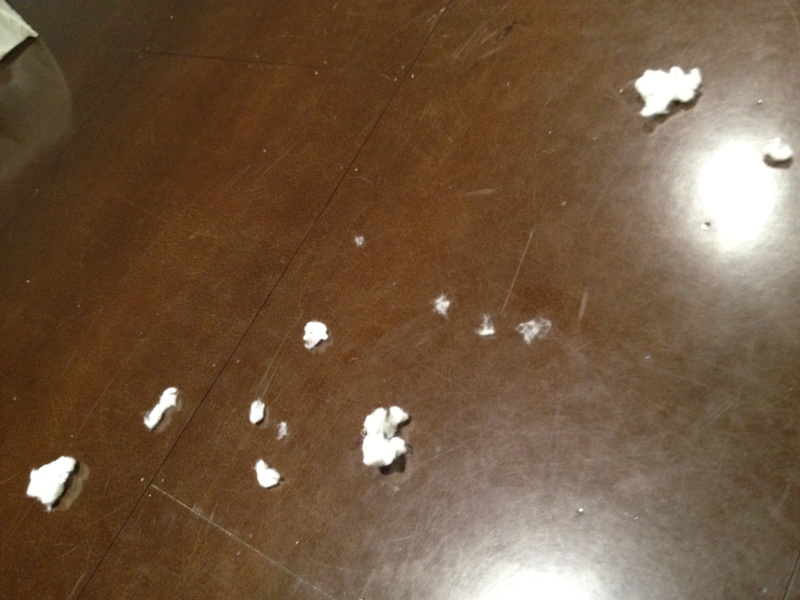 Below you will see snowy, Chris made him. 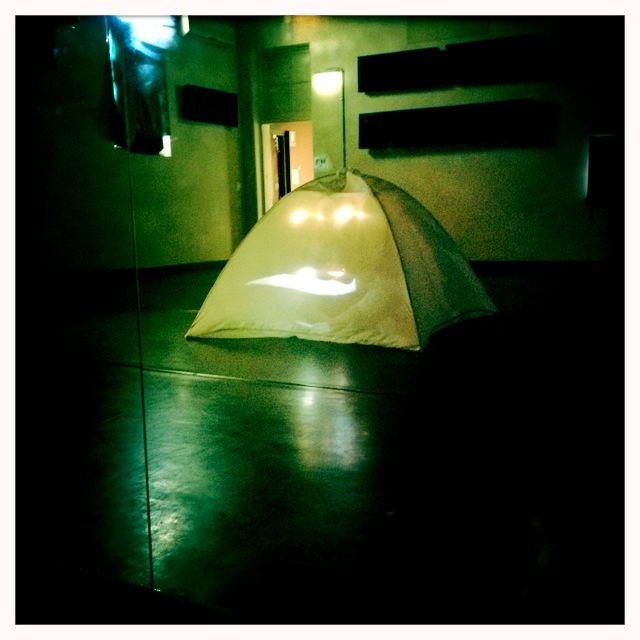 We also invented the below… it’s ‘light face tent man’…somehow, i don’t think it is going to make it into the show. We have also found our ending and solidified our beginning, so we have the bookends of the show in place, which is super dooper exciting! 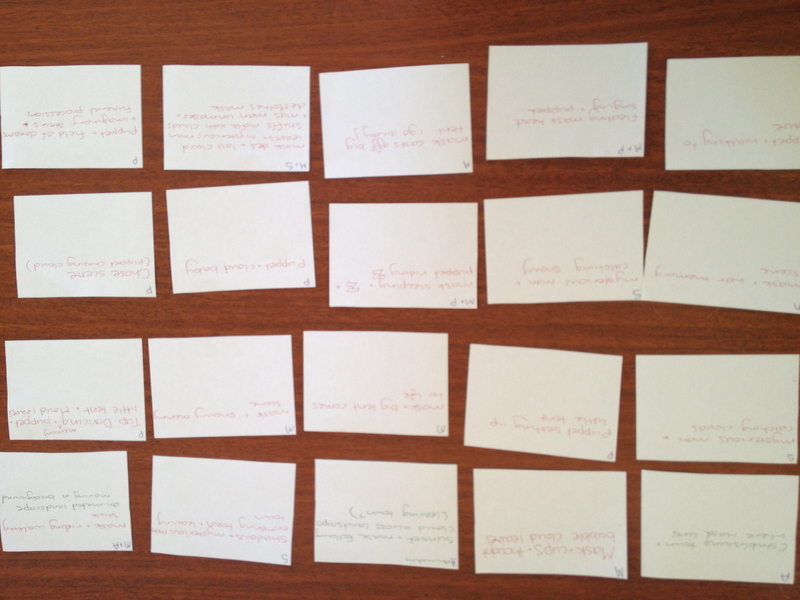 Coming up next on the blog… May Development – the second week… ooohhh what’s going to happen?? Alrighty, faithful blog readers. It’s update time and i am going to give you the hot update on what we did in our excellent one week development in April. 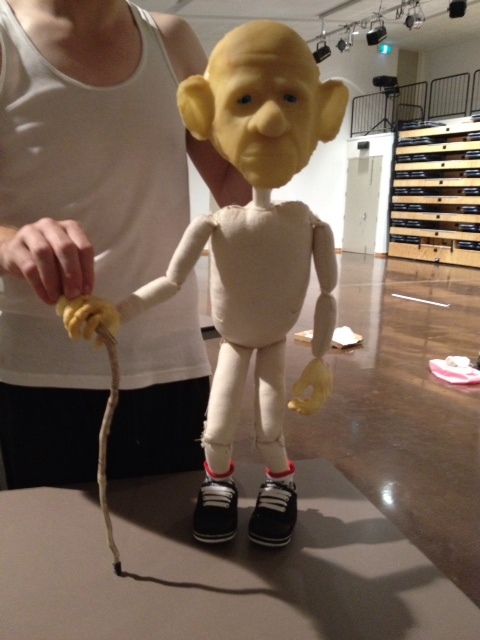 I am also going to show you a few piccies from the ODay ‘puppet demonstration’ that we did. We arrived at our lovely rehearsal space at MLC (yep the all-girls private school), they had been kind enough to let us use their studio while it was the school holidays! It was a beautiful space with sprung floors and a whole wall of mirrors, and no-one was around so it was very peaceful and there were no interruptions. We have officially brought Chris Isaacs on board for the show, Chris works with Tim and I very well and it was so wonderful having him in the room for the week. 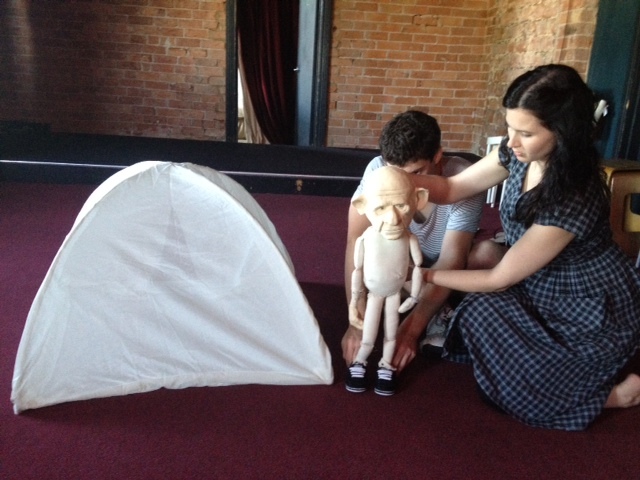 He is operating the puppet with Tim and I (he is the feet) as it is (at times) a three person job. He is also ‘onstage tech’ and much more. 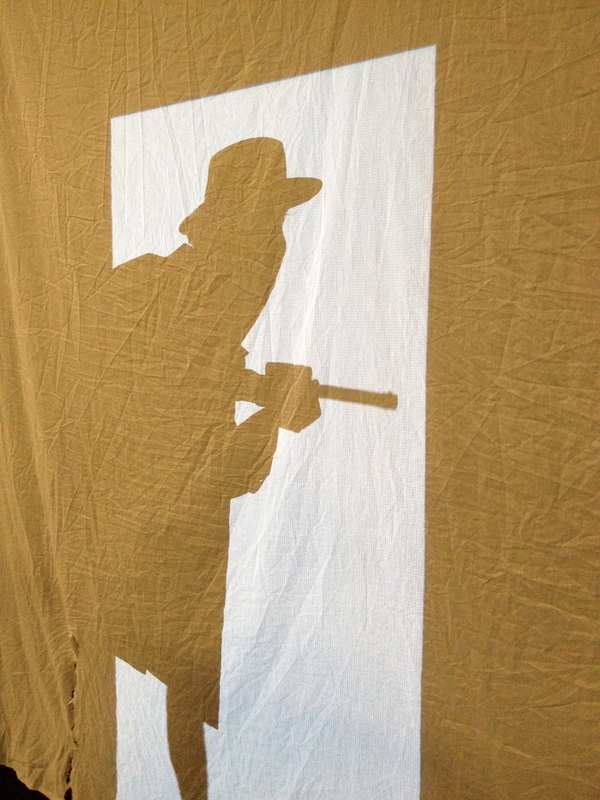 This week we really focussed on Puppetry and Mask work, which was just brilliant. We generated a lot of material and came up with some exciting ideas. The mirrors in the room were super helpful for me working in the mask and for the puppet, especially when all three of us were operating. 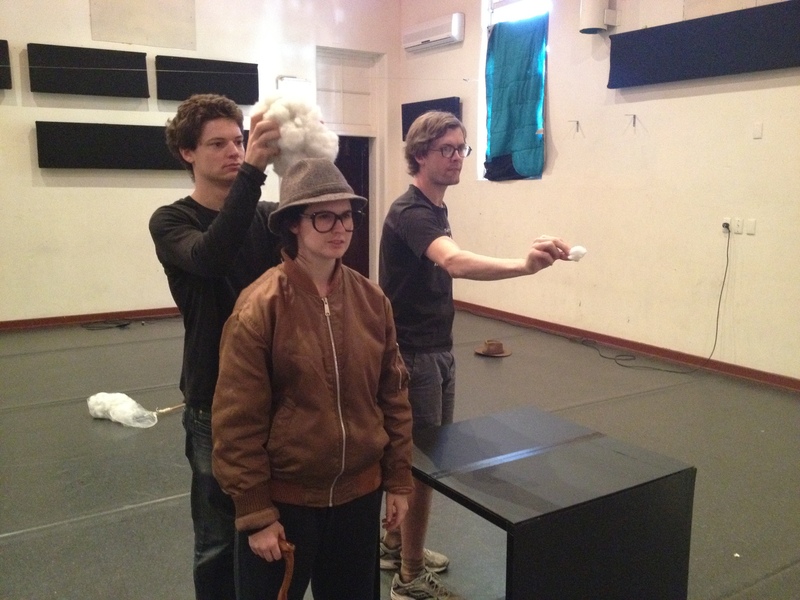 Since we are self-directing the work, being able to look at ourselves during a scene is very very useful! Unfortunately i did not take that many photos of the development, but below are a few that i took. 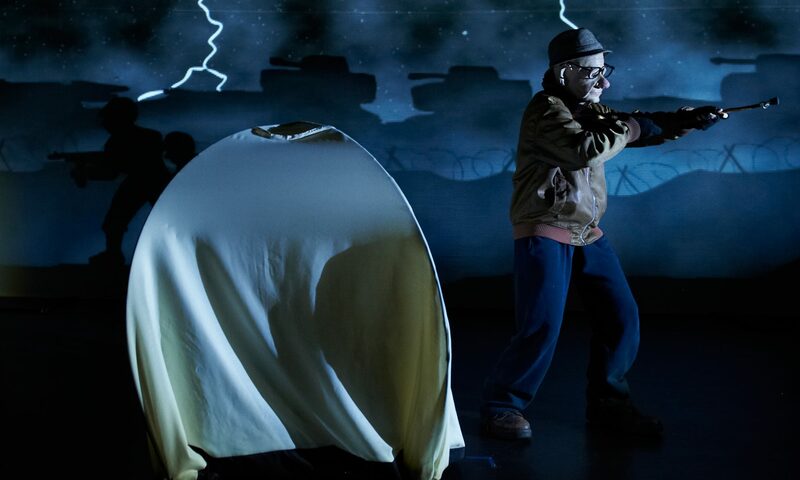 At the end of the week we did a small showing of all the scenes we came up with to Mel Cantwell (Artistic Director of PTC) and to Tim’s parents (Tony Watts – gadget extraordinaire and Julie Watts – poet and counsellor). Their feedback was great and we were very happy with the content we came up with in this week. 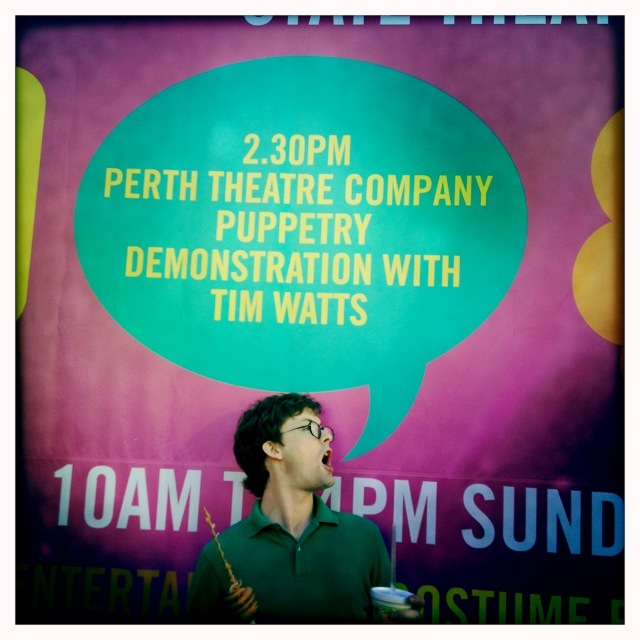 More recently, on Sunday 29th April we did a puppet demonstration in rehearsal room 2 at the State Theatre Centre of WA as part of the Cultural Centre O Day. We were expecting about 7 people to come, but we ended up with over 130 people! This is a pic of Tim doing some good talking before we got right down to it and showed everyone the puppet, and talked about how we had made him and how he works. There were quite a lot of kids there, and we were really surprised by how interested they were in the mechanics of the puppet! You can see him there on the right of the pic, sitting next to Chris, just hanging. Thanks to Kate from PTC for running the event and to everyone who came! Hey there blog readers of my blog. 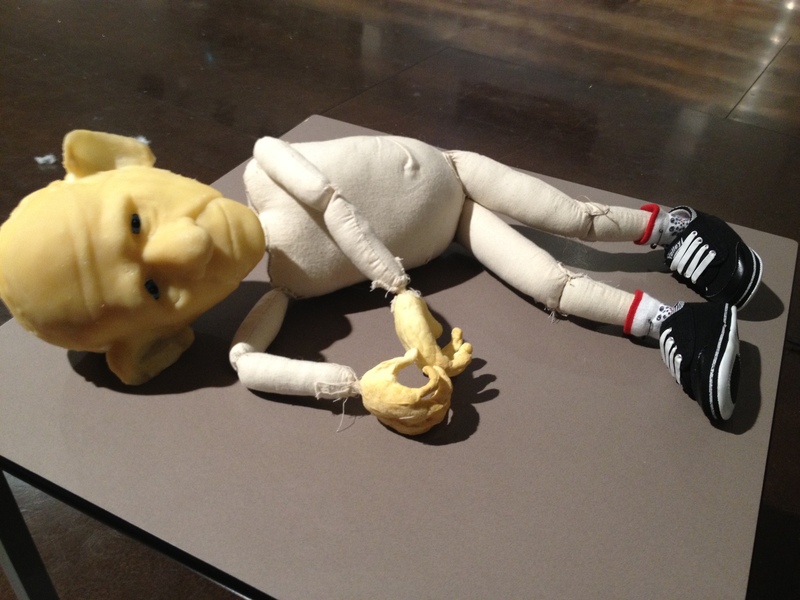 So my next update about the show is still about the puppet we have been working on. Tim has been in charge of the head and i am his helpful assistant. We have learnt heaps about new materials that we have never worked with before such as silicone and poly-something (plastic)… okay so maybe Tim learnt about them more than me… but i learnt a bit. 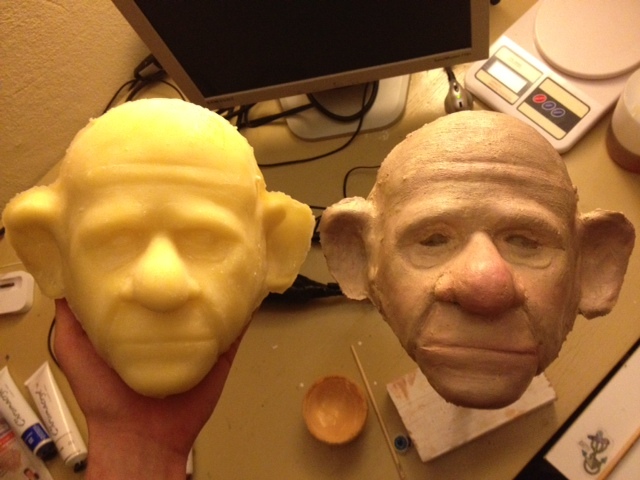 Anyway, after many many experiments we are using a head made of latex and filled with foam latex. I will talk you through how we made it and not focus too much on the rejected prototypes. okay, so it’s upside down but you get the picture, just turn your computer’s upside down! 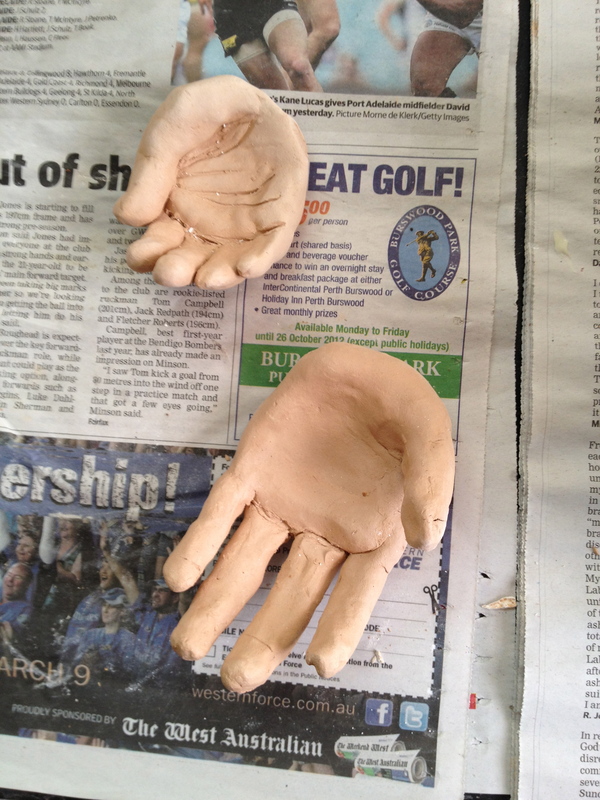 Step one: Make an amazing head out of clay and put a protective wall around it so that when you do the next step you don’t get plaster everywhere. Also vaseline it up so it doesn’t stick. oh my gosh, its the right way! 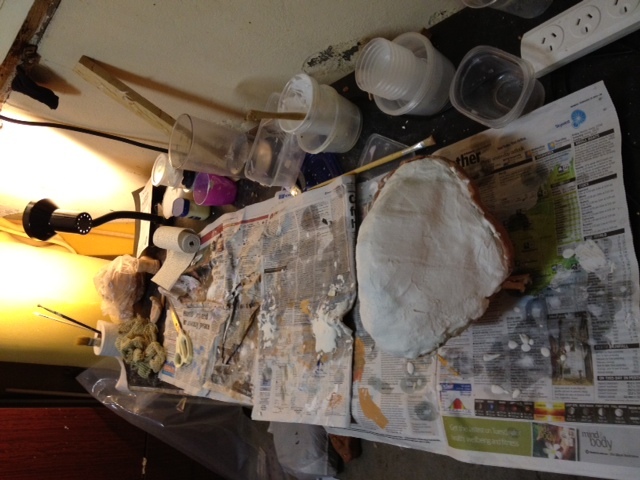 So this is the latex head final (i missed the step where you pour the latex into the plaster mould but that is what you do) and the latex painted (with latex and acrylic paint mixed together). Looks pretty snazzy! Just when you thought i had figured out angles, i get ya. So this is the fancy head mech Tim made out of pvc piping and inside the head there is a little bit of a tent pole so that the head can swivel up and down. It’s pretty awesome, because it works. Here is some practicing with the puppet and below is a closer picture of the puppet with the new hands that Tim made out of foam and latex. Also take note of the cute little volley shoes… they might change. Next blog i will tell you about the development we are doing this week on the show. It’s pretty exciting!! 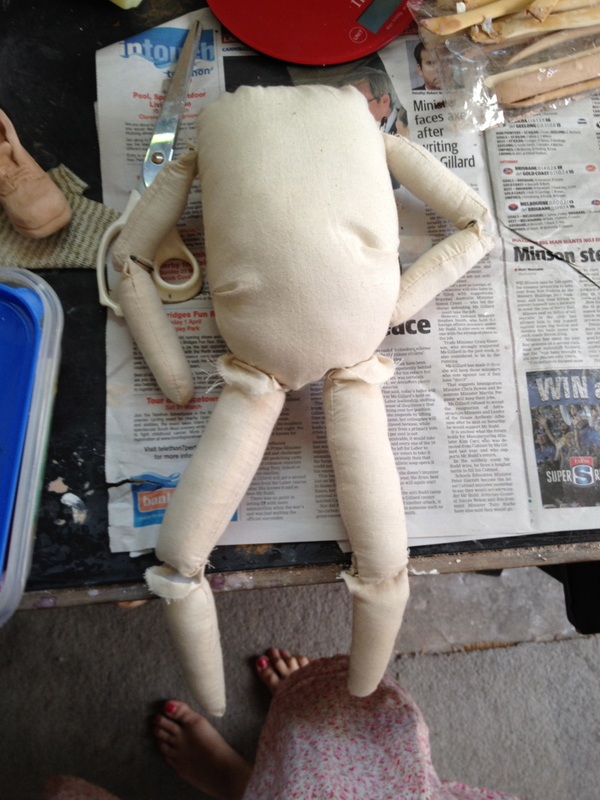 Tim and I have been attempting to make a puppet for It’s Dark Outside. 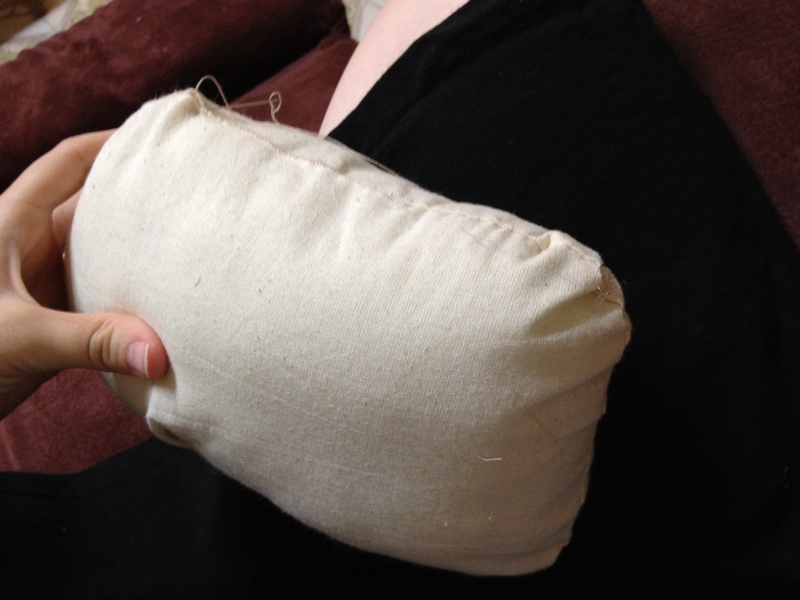 Tim is making the head and i am using my very basic sewing skills to try and sew together a very simple body. 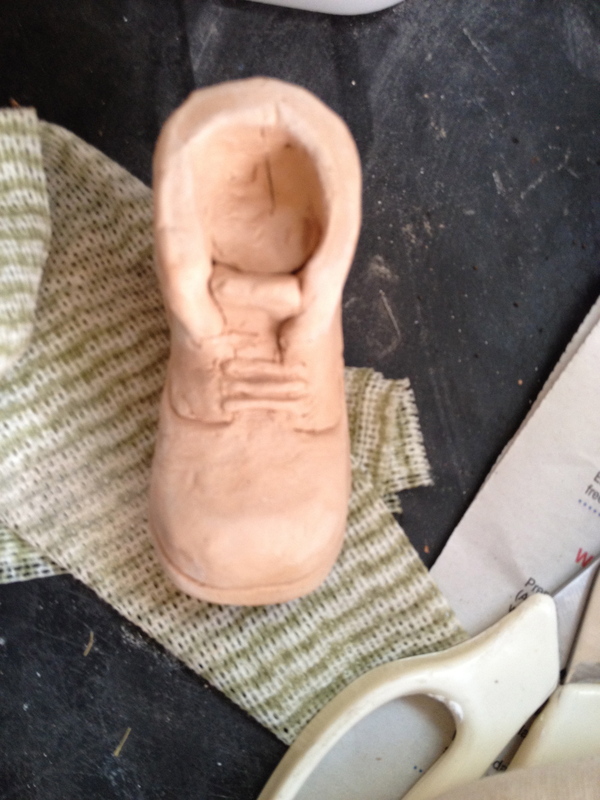 The hardest part is finding a way to make the joints (knees, elbows, shoulders, hips) move in a realistic way (i.e. no backwards knees). Just using Calico at the moment (thanks to Textile Traders for the material and the stuffing!) 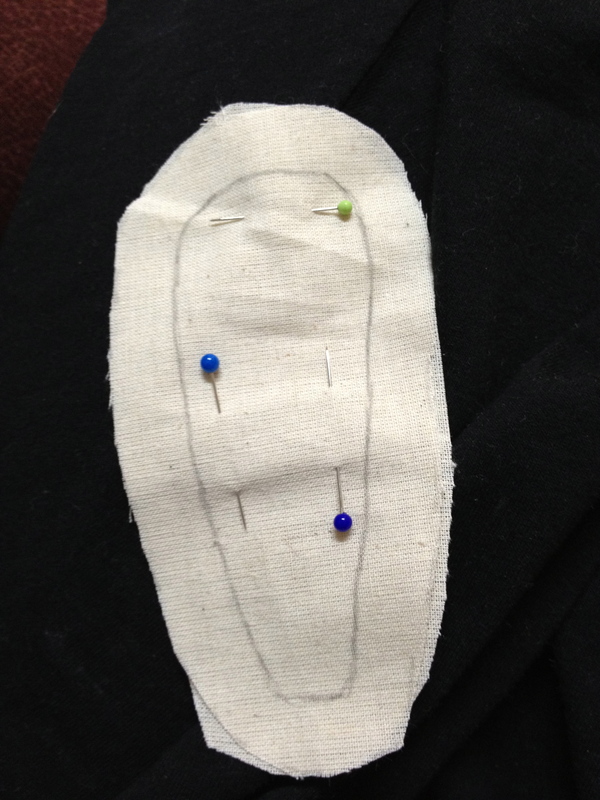 and just attaching the body parts together with safety pins until we can test it properly, and then i will sew it. 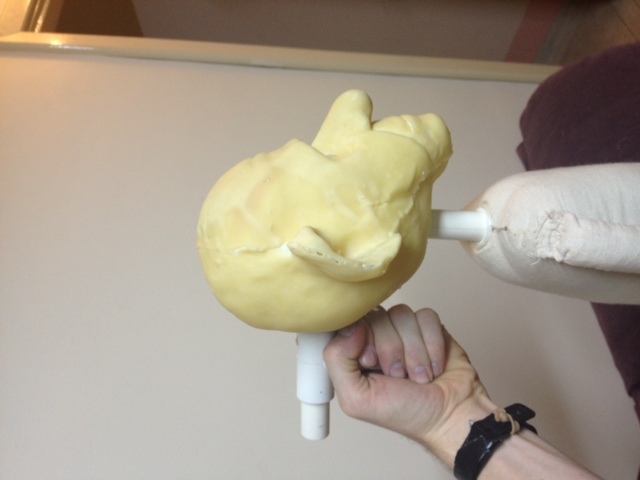 Next post i will show you how the head is shaping up. It looks pretty rad. Just thought i would update you on what i have been up to! Here are some pictures taken of some of the things we tried out!